Ivanka Trump, daughter of the United States president and advisor at the White House, on Sunday morning arrived in Ethiopia – the first leg of her two-nation African tour. 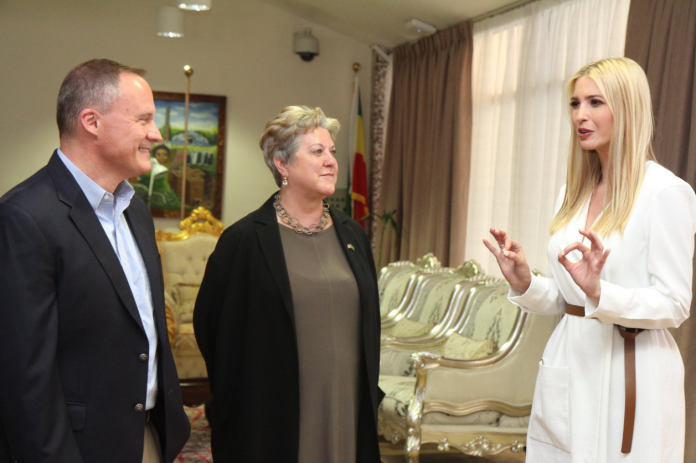 She has since met with Ambassador Michael Raynor and other top officials of the U.S. embassy in Addis Ababa ahead of her engagements which are the area of women’s inclusion and empowerment. While in Ethiopia, “Ms. Trump will discuss U.S.-led initiatives to promote opportunities for women’s inclusion and learn about ongoing efforts in meetings with Ethiopian government officials and the African Union as well as hold engagements with women leaders in business & civil society,” the embassy said. Her trip is linked to her involvement with the Women’s Global Development and Prosperity, WGDP, initiative. Ivanka Trump was accompanied by Administrator Mark Green of the United States Agency for International Development (USAID). The W-GDP is an initiative led by the White House to advance global women’s economic empowerment with a goal of reaching 50 million women in developing countries by 2025. After Ethiopia she will depart to Ivory Coast where she is expected to spend another two-days. Women Empowerment in Africa: Does Africa celebrate women leaders enough?